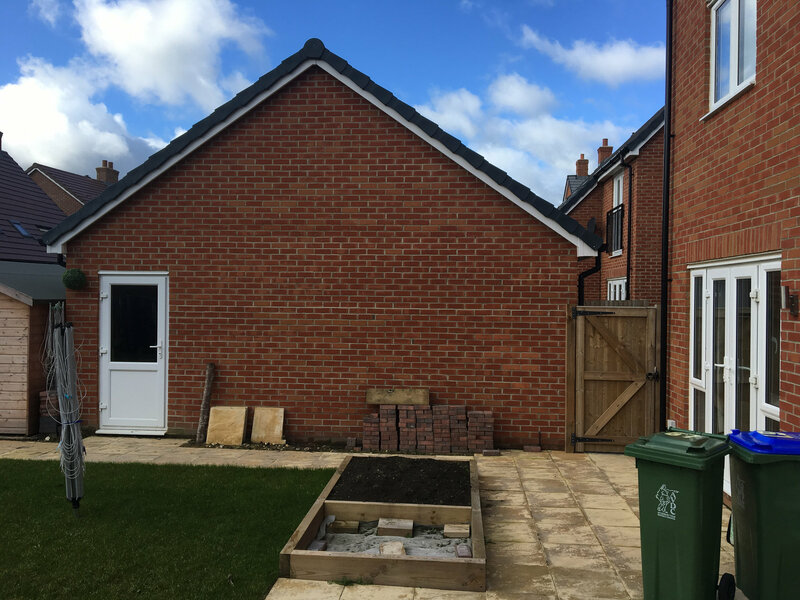 I moved into my first house, a new build, about a year ago. I've done quite a bit of "landscaping" to the South West facing garden but it's virtually plant free. I filled the beds with reasonable soil. Sadly the grass is on clay and doesn't drain. I'm totally green when it comes to gardening and I'm joining to hopefully get some help figuring out what to plant and then sharing how it all goes. The C shaped bed 430x280cm is intended for vegetables and things to interest my 3 yr old. I grew green beans against the wall last year. Those are strawberry plants in there now. 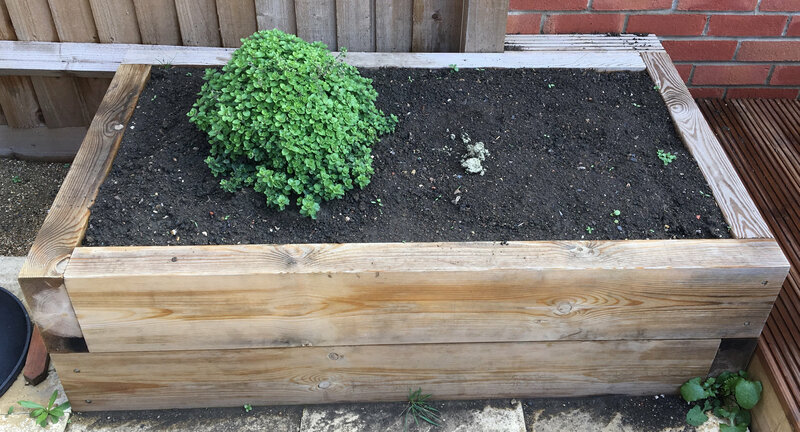 The small raised bed 63x120 is for herbs - that's oregano. The large bed is 120x146cm and the unfilled bit is going to be a sandpit. Finally, I need to do something against the stark garage wall. What direction does the garage wall face? That will dictate what will grow well there. And do you want free-standing shrubs or will you be attaching wires or trellis to the wall for climbers? For the veggies and herbs, choose what you and your family like to eat. If you just want a few plants of tomatoes etc you'll be able to buy them from garden centres in probably a month or so, but don't put tender stuff out until it's warm enough (round here it would be late may but it might be earlier or later where you are. An espalier or fan-trained fruit tree, or several cordons, would be good on the brick wall at the right side of the C-shaped bed, if it's your wall and you can fix wires for training them. 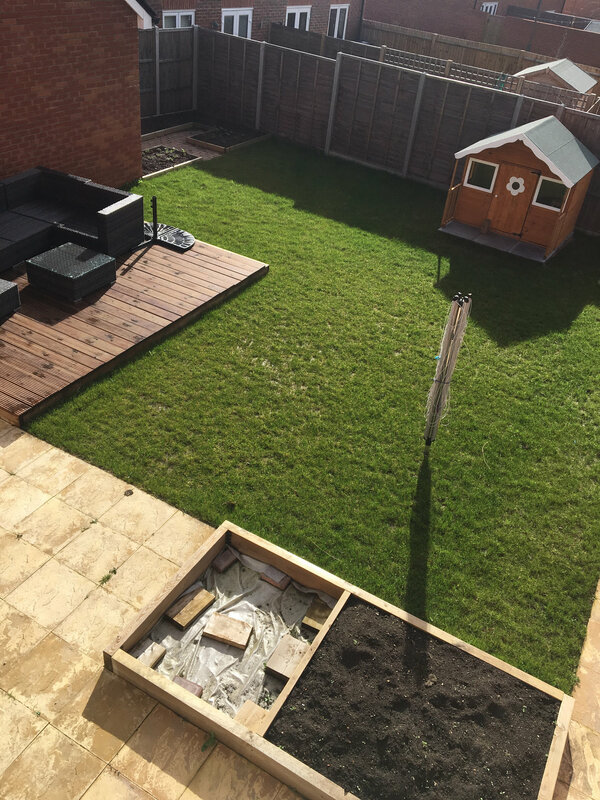 South West facing is a very good aspect, especially if you want to catch some rays on nice days after work. For your tree, please don’t do what I did and plant something too big because someday if you’re still there you’ll have to bite the bullet and cut it down which can be quite traumatic if like me you form attachments for your trees. There are many very nice patio Magnolias on the market these days that won’t take over and will provide a talking point when they flower. You will need slightly acid soil for these though. you could instead of a tree try a bit of topiary. This puts you in control of the size and shape and is good for wildlife depending on what you grow. I’m not talking about hedges shaped like chickens necessarily but if that’s what you want, go for it. 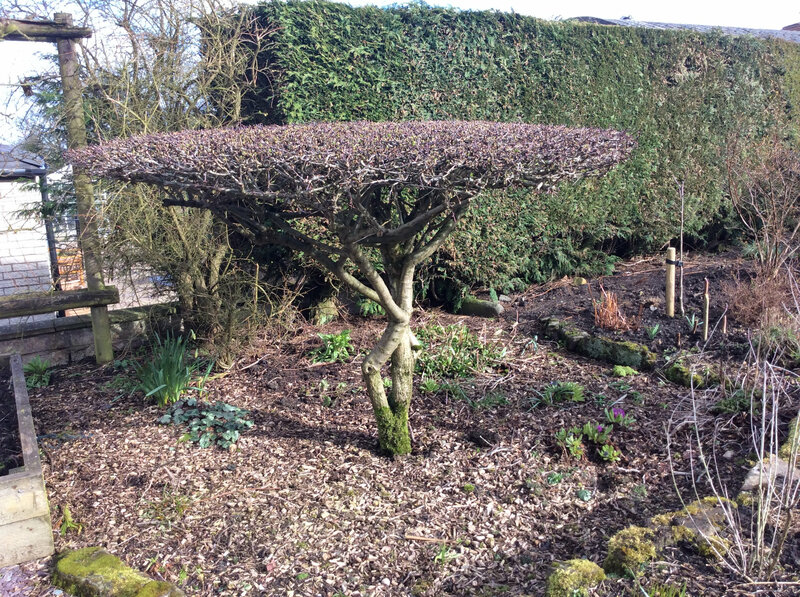 I have a hawthorn I keep to shape (see pic) and it’s very easy to manage. I use a machete to trim it but hedge trimmers will do. It’s not in leaf yet so the pic doesn’t do it justice but you get the idea. I was going for the African Savannah Acacia look in miniature. It’s simplicity itself but much commented on. Folk might say hawthorns jaggy for kids but none of my 7 grandchildren have ever pricked themselves on it. They’re not as daft as we sometimes think. 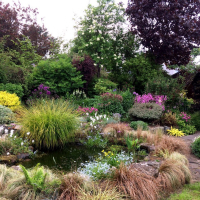 Good luck, starting a new gardens great fun and it’s also an opportunity to make a positive contribution to the wildlife in your area. The garage wall is NE facing and in shadow from the neighbour's garage a bit. I'm thinking some small shade tolerant shrubs along the bottom them some kind of fast(ish) growing creeper on wires screwed to the wall. What would you suggest? It's worth mentioning this place isn't our 'forever home', I think perhaps 5 years, 7 max. It's over 3 floors and the downstairs space is a bit cramped + the trek to the top is getting old quickly. I do like the idea of a trained tree or even a vine against the neighbour's garage wall in the veggie patch. He's fine with me drilling holes for eyelets. I'm a bit worried about the time they'd take to grow. 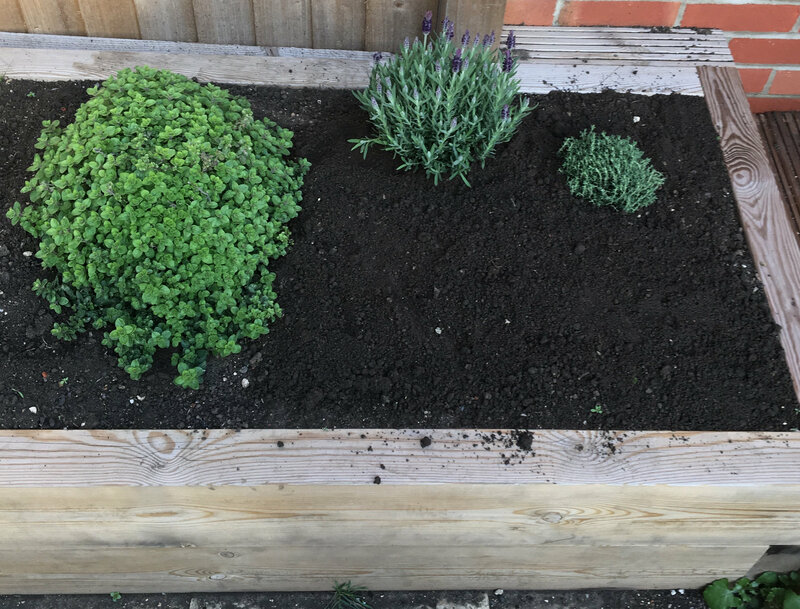 Bought a thyme and lavender today. The oregano is getting pretty big and between you and me isn't anywhere near as good as the dried stuff. Hmm..it's safe to say we're not going to be here long enough for a tree to fully mature. I was thinking of planting it in such a way that doesn't really block out much sun that isn't already blocked by the neighbour's houses/garage. Something that grows (hopefully quickly) up to about 4 or 5 metres would be fine. I fancy something with red leaves? Maple? P.S. Saw some magnolia trees/bushes just coming into flower today at the garden centre. Def on my wishlist but not for this house. They weren't exactly giving them away either. If you're not staying for the long term then go for the cheap and quick-growing, so probably not fruit trees, but you could maybe try some raspberry canes (although they can be invasive). Or maybe put up some trellis for outdoor cucumbers or squashes (it'll soon be time to sow seeds). For the garage wall, there's a long-ish list of climbers and wall shrubs for shade here https://www.rhs.org.uk/advice/profile?pid=467. I have Lonicera halliana, Jasminum nudiflorum (winter jasmine), Jasmine "Fiona Sunrise" and a variegated ivy on a North-East facing fence, and a Choisya ternata "Sundance" in front of it (this can get big but is OK with pruning). Fiona doesn't flower much but has nice bright yellow foliage. Is there such a thing as a miniature acer? They had really nice ones about 1m tall at the garden centre in three colours. I thought a 'spine' of 2 of those in the rectangular 1.2x1.4m bed could be a good start but not if they're going to grow. Any other ideas for the centre to give a bit (but not too much) height please? Acers are quite slow growing and are very pretty. They do lose their leaves in the winter but the outline still looks good. If you move after 5 years, you should be able to dig them up and take them with you (as long as you tell the buyers). 2 good evergreen honeysuckles for a shadier position are lonicera henryii or lonicera japonica "Hallina" Have a look on Google to see if one of those might do.